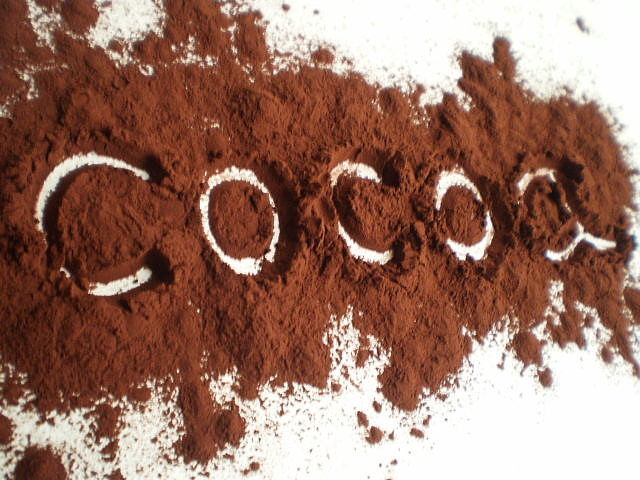 Before your mind goes down the yellow brick road of all your favorite chocolate desserts, remember cocoa can be used in sweet AND savory dishes! In fact it was Megan’s brother, Chip, who inspired me to pick cocoa. He once hosted a dinner party and every course had to feature cocoa. I thought that was the coolest idea. It’s all the rage right now. When I was researching places to go on our baby-moon, my boss brought in an article for me titled “Can you live on chocolate?” about St. Lucia’s Hotel Chocolat, a resort in the Caribbean. Dishes there range from chocolate-balsamic dipping sauce, seared tuna with cocoa pesto and cocoa ravioli sprinkled with cocoa nibs to cocoa bellinis (Thirsty Thursday, anyone?) and molten high-test dark chocolate. And it doesn’t stop there. Of course there are cocoa butter spa treatments and the guest cottages are decorated in tasteful shades of white and dark chocolate. Alas, this dreamy place was not in our baby-moon budget. But I’ll be sure to pick some up dark chocolate as we’re exploring Sedona, AZ and when we return all the recipes posted here will get my endorphins going! Wow. I'm stumped. Ok, here comes a good challenge! Enjoy Sedona!! It's beautiful there!